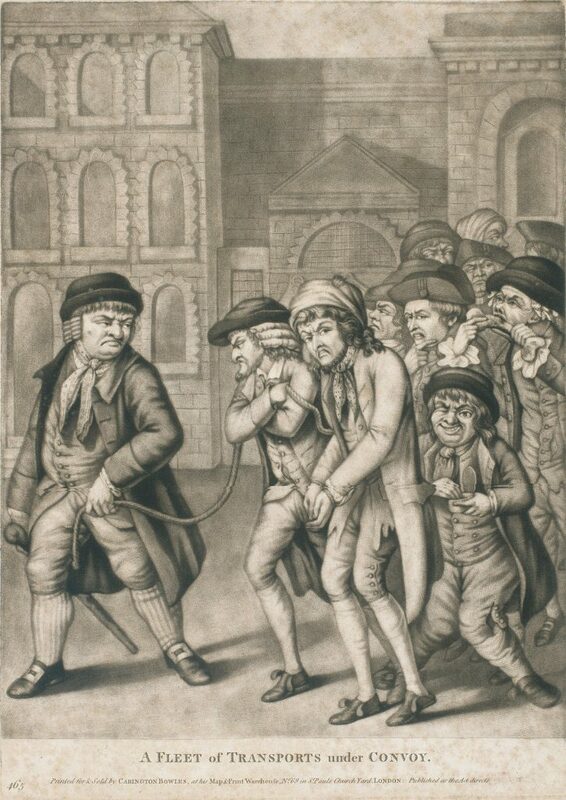 This caricature print shows a male guard (far left) leading a group of prisoners past the façade of London’s Newgate prison. The guard carries a ‘cudgel’ (ie. a short stick used as a weapon) in his right hand.He wears a round hat, or cap, with a very narrow, upturned brim which sits above his natural hair, cut with a short fringe and contrasting side curls which suggest he is wearing a cheap, and ill-fitting wig. He also wears a long-skirted, single-breasted jacket (or frock coat) fitted with a wide, turn back collar, and cuffs above a long-skirted, cut-away, single-breasted, flap-pocketed waistcoat, with a spotted neckerchief tied over his white shirt, hiding any sign of a collar, knee breeches buttoned over striped stockings and leather shoes with large, square metal buckles at the instep. The motley crew of 10 felons has been tied together with a rope. At the forefront of the group are two bearded men of generalised (ie. caricatured) Jewish appearance, followed by a knock-kneed, debauched youth taking a pinch of snuff, and a man gnawing on a large bone. The prisoners wear an array of well-worn, rumpled (and some ragged) garments; several seem also to have sold or pawned their shoe buckles. By the time this image was printed (c.1788) transportation of British convicts to the American Colonies had ceased, owing to the War of Independence (1775-83), which necessitated the use of decommissioned ships, or hulks, as temporary floating prisons anchored in the Thames River and at other locations around the British coastline. Apart from any private possessions convicts may have had, once imprisoned or transported they were forced to rely on government provisioning, which operated outside traditional patterns of clothes marketing that provided access to a complex network of shops selling new, made-to-measure and ready-made ‘slop’ clothing, and pawnbrokers and market stalls selling second-hand, stolen and cast-off garments.